I spend a ton of time outdoors and my dog Penny is usually with me. We walk every morning and evening for about an hour each time. We both enjoy this time of bonding and exercise and passing the time with neighbors. We go out in all kinds of weather and during all four seasons. 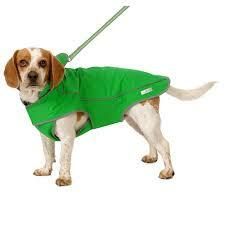 This past winter the need for Penny to have protection from rain, wind, cold and snow become very important. Since we had much more snow than normal (around 7ft fell in February and March) and exceptionally cold temperatures (in the single digits for an extended period), I wanted to put her in a coat or parka that would not only protect her from the elements but keep me from worrying about her health and safety during the super tough weather we were experiencing. I wanted something reflective since even during daylight visibility was terrible. Penny is trained to a leash and collar, but I decided to try her with a walking harness for dogs, that is also a parka. My friend Sue and I walk her dog Winston and Penny together on weekends. Not much keeps Sue and Winston in the house during the winter. When the weather is very cold or wet, she dresses Winston in this great parka that is waterproof and has a fleece lining. Sue also turned me on to some rubber booties to protect the Winstons foot pads from road salt and cold slushy snow. Sue told me that when we bundle up against the awful cold, we should protect our pets too. I agreed and bundled Penny up to brave the ferocious winter. Once Penny had her fashionable parka and rubber booties, we actually enjoyed our wintertime activities much more. We could stay out a little longer, exercise a little more and visit with Sue and Winston. Last winter was a huge challenge with all that snow and cold. But I felt better knowing Penny was warm enough and safe from the elements. I'm glad you and Penny are exercise buddies. Thanks! I'm glad we are too! Honestly, I don't think I would exercise at all if it weren't for Penny!